Mercedes C-Class C200 Sport Premium Plus 4dr 9G-Tronic 2019 Review | What Car? What Car? will save you at least £4,119, but our approved dealers could save you even more. 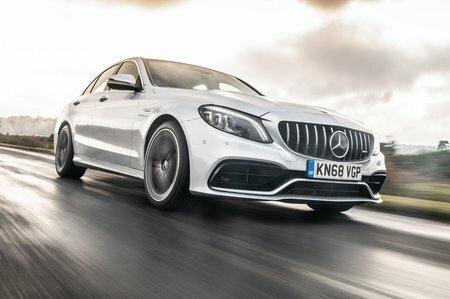 The Mercedes-AMG C63 is has rather a broad selection of talents. It has muscle car brutishness, courtesy of that thundering V8 engine, but it's no drag-racing, one-trick pony that's effective only in a straight line. It steers well and has a delightful chassis balance, blended with a comically easy ability to entertain with its progressive, sideways abilities. The Alfa Romeo Giulia Quadrifoglio may have a slight edge in terms of handling delicacy, but the C63 is still a great alternative. This trim gives you larger alloy wheels, sports seats and lowered suspension. You can also specify the optional Premium or Premium Plus packages – something you can’t do with SE. Given that it costs so much more than the entry-level trim, though, Sport is hard to justify.